PC Pitstop is proud to welcome our friends at pctechbytes.com as guest contributors. 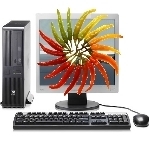 PCTechBytes has been a provider of free online tech support since 2002. Remember the love affair you once had with your computer? Those late nights sitting in front of the screen, your face aglow in its radiant LED light? You’d sit there for hours surfing AOL or playing games like Mahjong or Solitaire until your eyes were so dry you couldn’t blink. Ah, those were the days. But what happened? You glance at your computer in the corner and long for those days. But the magic has fizzled, and your computer is simply too drab and disgusting to hold your attention. Not anymore. We have several great tips to help revitalize your computer and bring the two of you back together for another shot at love. 1. Get your Desktop in order – Have you looked at your Windows Desktop lately? Unless you’re a neat-nick with Obsessive Compulsive Disorder, your desktop is likely polluted with shortcuts you never use, files you do not recognize, and miscellaneous pictures, videos and music files scattered about. Either create a single folder and drag these icons into it, or take a few minutes and put these items into their correct folder. You should be left with a spartan desktop containing only the Recycle Bin. Now change your background image. We like Desktop Nexus for great backgrounds. They re-size their backgrounds based on your screen resolution. 2. Get a new monitor – There’s nothing wrong with your computer. Your monitor is just too small. If you’re still using a 17″ or smaller computer monitor, you’re missing out. Stop scrolling up and down and side to side. Websites will be easier to navigate, movies will be easier to watch, and games will be a lot more fun on a larger monitor. PCTechBytes computer tips, old computers, old pcs, pc tips, pctechbytes. permalink. Ask Leo: Will You Lose Internet Access in July?